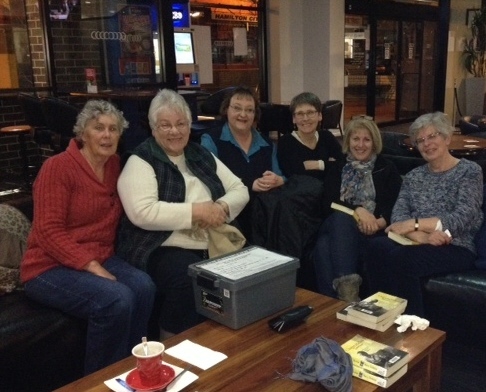 The St Mary’s Book Club has attracted avid readers since first launched in 2004 following a 2003 Parish Review when many social groups were considered. So now celebrating its tenth year, a group of Book Club women still gather on the first Wednesday of each month with the main objective to review a recently read novel. While time is normally set aside to discuss each member’s thoughts on the author’s work, we are soon distracted to active discussion on current or past social events and family. In the last few years we have made ourselves at home at the Blue Malt Restaurant, previously meeting at the Cally and Roxburgh in Hamilton. The friendly Blue Malt staff continue to welcome us each month to their venue, where we also welcome their servings of Coffee/Wine and Cake. Books have been supplied by Central Highlands Library Service since 2006, having previously been provided by Monivae College Library, gratefully assisted by Maree Bell. The novels have varied over the years, with the Library offering both Fiction and Non-Fiction titles to the group. The annual membership of $20 covers the fee charged by the Library’s Book Club Service. New members are always welcome, with further enquiries made to Val Lovell on 5571 9008.